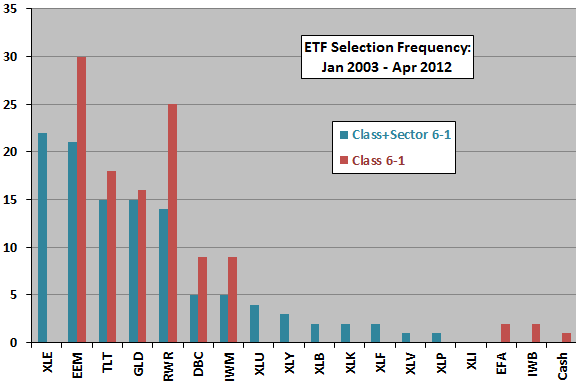 The following chart compares the distribution of winning ETFs based on past six-month momentum over the available sample period for the combined sector and asset class strategy (Class+Sector 6-1) and the asset class strategy alone (Class 6-1). Availability of sector ETFs substantially displaces equity, real estate and commodities ETFs. 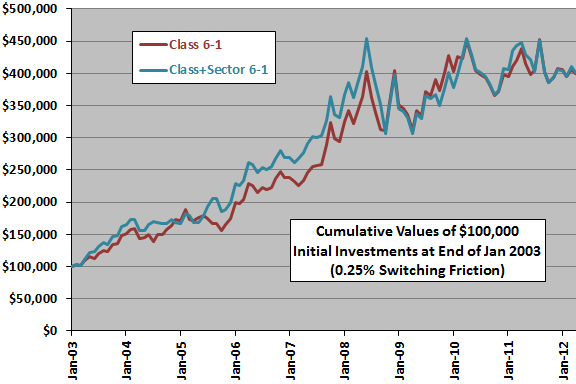 How does applying the Class+Sector 6-1 strategy translate into cumulative returns? Reallocate at the close on the last trading day of each month (assume that total six-month past returns for the ETFs can be calculated just before the close). Trading (switching) friction is 0.25% of the balance whenever there is an ETF switch. At the assumed level of switching friction, the two strategies perform similarly, with a slight edge to the combined strategy. The number of switches for Class+Sector 6-1 is 53, compared to 45 for Class 6-1, so a lower level of trading friction would favor the combined strategy. The average net monthly return for Class+Sector 6-1 (Class 6-1) is 1.44% (1.43%), with standard deviation 6.04% (5.92%), confirming performance similarly. In summary, evidence from simple tests indicates that a combined asset class and U.S. equity sector momentum ETF strategy performs similarly to the asset class momentum ETF strategy. The sector ETFs effectively displace large capitalization stock ETFs. Sample size is modest (about 20 independent six-month momentum ranking intervals). The selected ETF ranking interval derives from prior academic studies that most often use six-month and 12-month ranking intervals, with one-month holding intervals. This prior research may impound (and therefore transmit) data snooping bias, which is especially pernicious for small samples. Ranking intervals other than six months and holding periods other than one month may produce different results. For the above tests, using longer ranking and holding intervals would effectively reduce the already-small sample size. Optimizing the ranking and holding intervals would elevate data snooping bias.